about-face came as suspicion fell increasingly on her son Scott. and that she was weighted down with cement and dumped into a remote body of water. to say she'd completed her 14-page report, she got a puzzling reception. seemed to have changed since she hired me. She was a good deal less friendly." 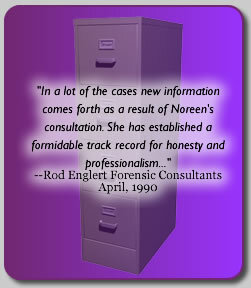 phenomenal success in working with difficult-to-solve cases. Scott Peterson's truck. I told Mrs. Peterson, and she sent me a replacement check. It was obviously mailed by Scott - his return address is on the envelope." At Renier's request, Mrs. Peterson sent the psychic personal items belonging to Laci. those items with me during the psychic sessions - and I held Scott's envelope at all times." denied hiring Renier and accused Modesto police of leaking the story. "She does not have a check from me. If you have a copy of the check you can print the story." and made a number of shocking discoveries. Modesto as she was preparing to walk the dog, and he was heading out on a fishing trip. Laci and suddenly told Dr. McMahon, "I am in a vehicle. I back out of the driveway. I feel a laying down and being put in (to the vehicle.)" Renier revealed she was concealed under a rug or cloth- then loosed a thunderbolt. "I am already dead," the psychic said. "You're dead when you're in the vehicle?" Dr. McMahon asked. "Yes," Renier confirmed, adding, "It's late. Late at night or going into the early morning." and says: "I'm putting her into the water with cement. It's around her. It's for her to sink." Laci was murdered, she sees the murder weapon - it could be a club or a bat. "It is something you can hold in your hand and hit a person on the head," she said. But most disturbing of all is the psychic's epiction of Laci lying beneath water. "I think I am at the bottom. I'm stationary....the water rushing past me." 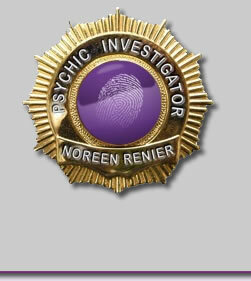 aided by a second psychic guide, Sheri Enzor-Renier identified once again with Laci. there was pushing and yelling. He does have a temper and most of the time it is controlled." compelled to send copies of her bombshell report to detectives hunting Laci's killer. everything I've done, Reinier added. I just pray it helps them solve this awful crime.